This year I chose to undertake a long, slow prep for competition which has been great in some ways, cause I’ve still been eating loads and it’s been less intense. 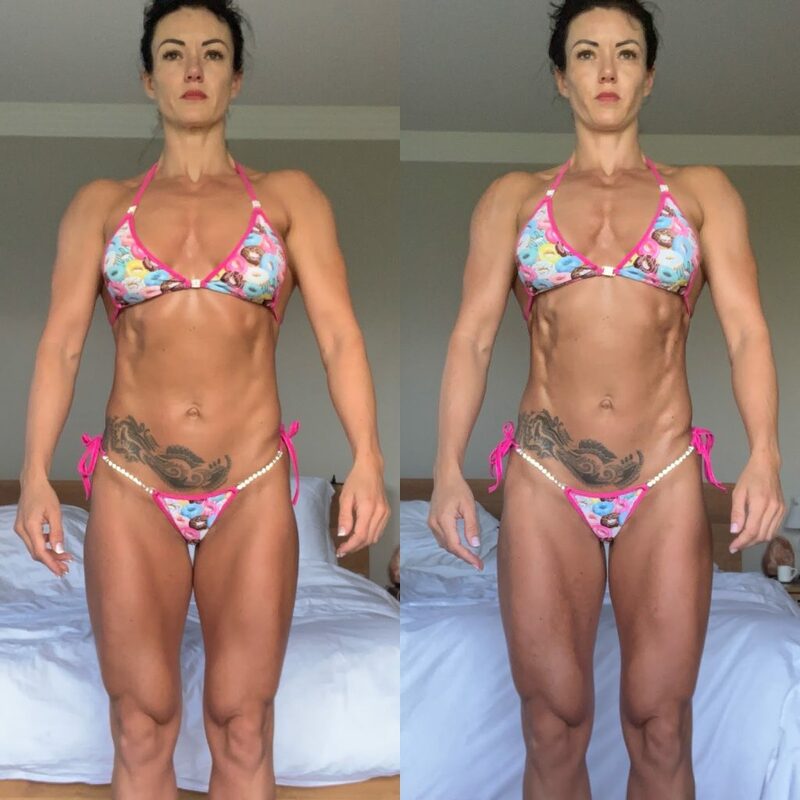 I also went on a 7 day holiday only 6 weeks out from my show. People were confused. Should you be going on holiday so close to your show? One thing I have learned over many years of dieting and training is that you can do exactly what you want both on prep and off, as long as you maintain consistency with your diet and training. I even managed to come back MUCH leaner than any other week previously in my prep! 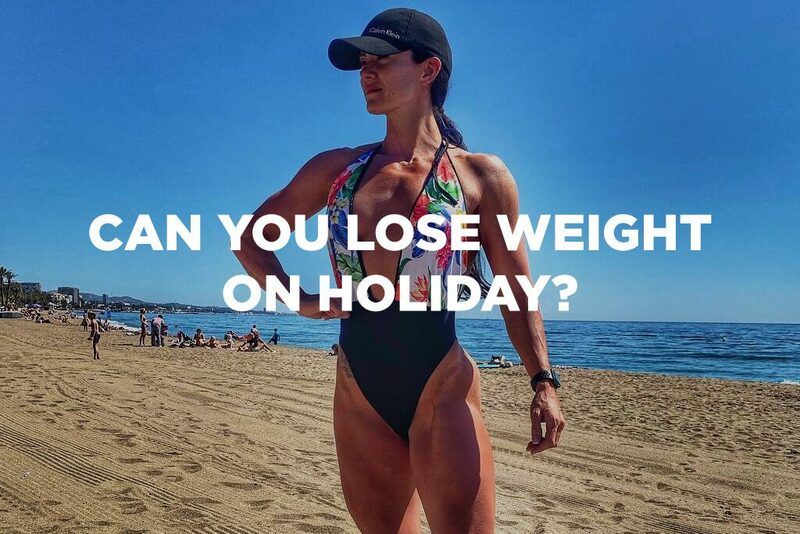 Is it possible to lose weight on holiday? Damn right it is. 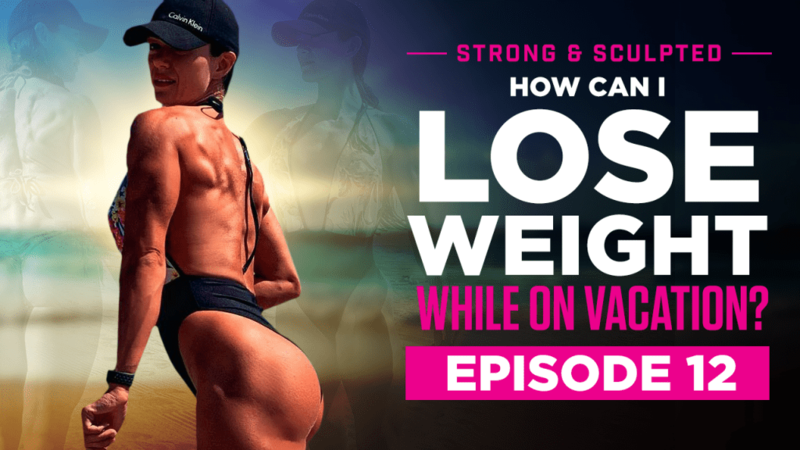 You just need to know the secret of preparation and planning, which I share with you in this week’s episode of Strong & Sculpted. Click below to watch it now. Do you avoid going on holiday in case you wreck your diet? Or do you just not give a damn when away, and let it all hang loose? Leave a comment and let me know! Kim: It’s like trying to control a small herd of goats in public whenever we travel. What was your favourite part about the holiday? Child: Spending time with you. Kim: Aww spending time with mummy, that’s really sweet. Kim: So it’s been really handy just to, you know, really I just wanted to come away with the kids on prep to have a bit of a change of scenery. I felt recently like I was just on Groundhog Day to be honest. I felt like it was, I got up in the morning and I got on the stair master and then I would have breakfast, then I would work until 2pm and then I’d go to the gym and train and then I’d come home and I would feed the kids dinner, then I’d be on the stair master again and it just felt like every single days Groundhog Day and I said to my husband last week, we home school our kids, so we have complete freedom to travel with them anytime we want. I messaged Ryan and I said let’s just go away because I really feel like I need some sun. So I’ve managed actually to top up my tan which is quite good, see, look, so I’ve topped up my tan for prepping, for the stage and I just feel like I’ve had a real mental break, even though I’ve actually eaten less, exercised more and probably worked harder here, it’s been lovely just to spend some time with the kids. There’s no reason why the whole family should suffer whenever you’re prepping, which is actually normally what happens, you know, the family are the ones that suffer because I’m always saying no, I can’t go out for dinner, no I can’t do this, no I can’t do that, no I don’t have enough time because I’m always doing my cardio. So it’s been really wonderful for them too. So I’m going to go and eat my Seitan, I’m just going to eat it by itself with nothing because that’s what you do when you’re prepping and then we’re going to meet some friends later for dinner. It’s been absolutely gorgeous, it’s only mid-March here in Spain and normally it’s just not quite as warm but it’s just been absolutely beautiful and it’s funny how whenever you are away from home, that you relax so much better. At home I’m always flat out working and you know prepping and cardio and you just feel like …Even though we have a full time housekeeper and a full time chef, I still, there still seems to be loads to do. The beautiful thing about being away on holiday is that you’re so much more available for your family, so much more time to spend and I think that it’s so important whenever you work as hard as I do and you train as hard as I do, to really make time to balance the family and the great thing about my business is that, it continues to run whether I’m there or not. I have an amazing team in place who run everything for me and the business still works and still churns away even whenever I’m not there creating, although I am working on an amazing new programme at the minute which is my exact 16 week prep which is going to be released in the next couple of months. So I’m going to finish it on the plane on the way home tomorrow I think and yeah you can look out for that as well. These nutters are right in the water, I’m going to show them to you. Hey guys we need to go in 5 minutes because we need to meet Caroline for dinner. It’s our last day here in Marbella but we don’t actually leave until about 5pm, so Ryan and I are going to take the kids to the beach this morning while the weather is good because it’s supposed to be a bit cloudy this afternoon and then he and I are going to go and do a big walk and some cardio and then we’re going to train this afternoon in the gym and we’re going to train some chest and some triceps. I’ve had the absolutely loveliest time and even though I’ve probably eaten a little bit off diet, I have been doing an enormous amount of cardio and training and I don’t feel guilty one bit because my show is still 6 weeks away, so I have kind of the next 6 weeks to really pull it out of the bag and make a big difference. So whenever I get back home I’m going to knuckle down, get the work done and shred off, probably I would say another 4lbs – 5lbs and hit the stage looking really, really ripped but my problem is, that I actually have too much muscle at the minute for bikini so I have to be careful not to come in too hard in my condition because if I come in too hard, they will move me up a category and you do not want to be moved up a category because then you’re not prepared and you don’t have the right bikini and all the rest of it. Anyway, let’s hit the beach now and then we’ll train later and head home tonight and it’s kind of back to normality tomorrow, but it’s been lovely just to get this break. Everybody else here is walking around in coats and scarves and they all think we’re crazy because we’re heading to the beach in our bikinis at 9am. Ryan and I are just heading off to the gym. The wind has really picked up today. We haven’t done any packing or any organising but we have cooked lunch so we’re going to train now and then go back and pack up and head to the airport. No better way to start a day really is it or spend a day, the sea is really choppy now. The gym is about a 1.5km walk from our villa, so it’s actually a nice way to warm up on the way here, although I’ve just done a 6km walk, so I’m well warmed up anyway. So that is us finished, chest and triceps. We’re just going to walk along the beach now heading back to the villa. We’re going to get packed up. The wind has died down a bit, we might even spend an hour on the beach with the kids before we go and then head back to Belfast and head back to reality, back to the rain away from the sunshine. So always post-workout, I drink 50g of Vitargo, nearly getting knocked down and Ryan’s going whoa, as I’m walking along talking into my thing. I always drink 50g of the Protein Works Protein Powder with a scoop of Vitargo which is a high molecular weight carbohydrate to fuel the muscles, a scoop of L-glutamine and a scoop of Leucine as well. So I’m going to drink that now, replenish and refuel the muscles. Got a nice little 1.5km walk back to the villa and then pack up and head home. So I’ve now been packing for about 2 hours and you would think it would be easy to pack going home because all you do is chuck everything in the suitcase but it’s actually not easy at all. Look at all of our suitcases. So I have 3 suitcases packed here and then I have another one here for travelling whenever we’re on the plane for all the food and stuff and then I have another main suitcase over here for Ryan and I and then I have this suitcase which, sorry Lorraine is coming home to you. Lorraine is my housekeeper and she is absolutely amazing and the beautiful thing about having a housekeeper is that we’ll go home, we’ll arrive home at about 9.30pm or 10.30pm and Lorraine will come in and she will unpack all the suitcases, put everything away and do all the laundry. I really am spoiled rotten. So yeah, nearly there so literally one, two, three, four, five, six, seven, seven suitcases and a couple of holdalls and we’re nearly getting ready to go. I’m just going to go make some sandwiches for the kids now so that they have something eat on the flight. It’s very hard to be a vegan because they never have anything vegan on the plane, so what I normally do is cook my food and bring it with me and then whenever I’m hungry, just take it out and just eat it, it’s really the only way to travel as a vegan. I really need the airlines to sort it out and have more vegan options because it’s shocking, like they really don’t have any vegan options whatsoever, not that I would eat it at the minute because I’m on prep anyway but whenever I’m not on prep, it’s actually very irritating not to have anything to eat.